(Nanowerk News) A team of chemists at Penn State has developed a designer’s toolkit that lets them build various levels of complexity into nanoparticles using a simple, mix-and-match process. “Researchers in areas as diverse as medicine, energy and electronics often design complex nanoscale particles that are predicted to have useful functions,” said Raymond E. Schaak, DuPont Professor of Materials Chemistry at Penn State and the leader of the research team. “But making them in the laboratory is often the bottleneck. 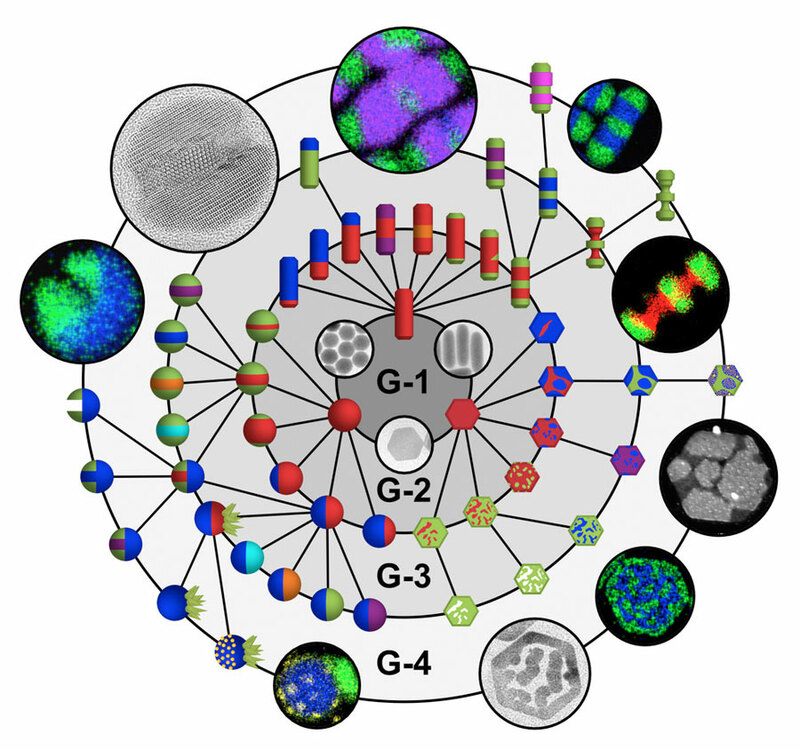 Our strategy can help to streamline this process.” A paper describing the team’s strategy and the large library of particles that they can now make appears in the journal Science ("Tunable intraparticle frameworks for creating complex heterostructured nanoparticle libraries"). Scientists and engineers are getting better and better at designing nanoparticles to split water using sunlight, to diagnose and treat cancer, and to solve other important problems. Many of these ‘designer’ particles need to include various types of semiconductors, catalysts, magnets and other materials to function, all while meeting strict requirements involving their size and shape. The researchers begin with what they call first-generation particles that have nanometer-scale dimensions and are similar in size to viruses. These are simple, easy-to-make copper sulfide spheres, rods and plates that serve as springboards for more complex derivatives. These first-generation particles define the initial size and shape, and after replacing some of the copper with other elements such as cadmium and zinc, they are transformed to second-generation particles that now include two materials. The new material is carved into a portion of the original copper sulfide, forming various types of lines or shapes. These lines represent the junctions between the two materials, defining frameworks within the particles and creating two-faced spheres, sandwich spheres, capped rods, striped rods, patchy plates and marbled plates. All of the second-generation particles still contain some copper sulfide. This ‘leftover’ copper sulfide can also be replaced, producing third-generation particles that retain the first-generation size and shape and the second-generation junctions while containing completely different materials than the original first-generation particles. Higher-generation particles are made by further mixing and matching of various techniques and materials. Ultimately, the researchers easily generated a library of 47 distinct nanoparticles from the three simple first-generation spheres, rods and plates. Some of the particles the team has made are among the most complex reported to date, including non-symmetrical particles, particles with holes and notches in them, and intricately sculpted particles. “What is most exciting is how easily this works. We can sit down and draw a picture of a really complex particle that was unthinkable months ago, and then go in the lab and make it right away. This is truly a designer’s toolkit,” said Schaak.